The wait is finally over — British Airways has just revealed their new business class seat, which will be in service in just a few short months. British Airways’ new business class product will be called Club Suite. With this new seat, British Airways will not only offer fully flat beds with direct aisle access, but they’ll also offer doors at every seat, similar to what Qatar and Delta have. British Airways’ Club Suite is essentially a reverse herringbone seat, which is one of the most popular business class seats in the world nowadays. What makes this special is that it’s the first reverse herringbone seat to have a door. This all matches what was speculated a couple of days back. With the new Club Suite product, they’ll feature direct aisle access from every seat, with a 1-2-1 configuration. The seat will feature 40% more storage, a vanity unit and mirror, wifi, inflight entertainment screens of up to 18.5″ with gate-to-gate programming, and PC and USB power at every seat. British Airways will take delivery of their first A350 this summer. The plan is that as of July 1, 2019, the plane will fly between London and Madrid for several months, in order to familiarize crews with the plane. The flight numbers for this haven’t yet been announced. This is a pretty standard practice in the airline industry, to work out any kinks before starting longer flights with the plane. Then as of October 1, 2019, the British Airways A350 will begin longhaul operations. It will fly to Toronto as of October 1, 2019 (BA93/92), and to Dubai as of October 8, 2019 (BA107/106). By the end of 2019 we should see a total of six planes with the new Club Suite — four newly delivered A350s, and two 777s that are reconfigured with these seats. Then in 2020 we should see the rate at which planes are reconfigured increased. Unfortunately it’s likely going to be many years before this product is found throughout British Airways’ fleet. So within the next year or so this is more of a gimmick than anything, given how few people will actually get to fly it. British Airways’ new Club Suite looks stunning, and to say this represents a significant improvement for the airline would be a serious understatement. Of course in the short term the challenge will be the same as for any airline — people get excited about the new seat, but very few people will actually experience it in the next couple of years, as rollout tends to be slow. What I find interesting here is that British Airways’ business class will arguably be better than their first class. While the initial batch of A350 deliveries won’t have first class, it’s still interesting to me that the airline is using very similar seats in first and business class, except in business class there’s a door. I can’t want to try this new product! What are your initial impressions of British Airways’ Club Suite? This is basically British Airways first class with a door…probably the best business class seat out there once it starts flying, though! This is fantastic news. It doesn’t look to be quite as good as a Qsuite – but I’m struggling to think of anything else on the market which looks as good as this. Now for the difficult bit: how long will it take to be installed on the whole fleet (save those retiring 747s)? Looking back, BA has been pretty good at creating a standardised product fleet-wide, so I would expect them to do this fairly rapidly – and especially if BA starts seeing increased sales as a result of the new product. I’ve got a Toronto flight sometime this winter, so should be a good chance to try it. But now I’m really looking forward to seeing how they’re going to top this for their new First. Looks good but BA will also need to invest in proper cleaning and maintenance of these new seats to keep them in top condition which is sadly lacking at the moment. Thanks for waking up so early @Lucky to be the first to bring this report. Looks like a great seat. For once a positive surprise from BA. Excellent. Well done BA. This looks like a great product. What now for BA First? I know the A350s won’t have a First Cabin, but it’s still a little odd to have a business class product which is better than the airlines First product in many ways. See Qatar, whose Qsuites is in many ways better than their First (but the two types, as with BA, are not on the same plane). But I think we all expect a new First hard product to be announced by BA in the next few weeks. Even lesser J seats available for award redemption? 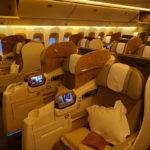 I have started choosing Business Class over First Class for long haul flights in recent years due to the lack of air circulation in the enclosed spaces of individual First Class seats. Air circulation in First Class is also a problem when the First Class section is small and curtained off in the nose of the plane. Has this issue been addressed in these new Business Class seats? Privacy is great, but without good airflow, the experience can be most unpleasant and not at all conducive to sleep. @ Flyingfish — Well British Airways continues to promise they’ll offer at least two business class award seats per flight, and that promise remains. Beyond that I guess it depends. @ Ben Holz — Not a full-on new seat, but I do think they’re making some minor tweaks to their 777 first class seat. I believe that’s just to get it in line with the 787 seat, though. I wouldn’t expect any major enhancements. @ The nice Paul, yeah I feel there’s a bit of a difference though as Qatar don’t have many planes with a First Cabin, whereas BA have a large number of routes operating with First. Fingers crossed for a new First seat, although like @Ben Holz says, it’s hard to believe BA could come up with something even better than this for First. The more interesting thing will be once they start replacing the business class dense planes like the 747 to New York is what they will do with the prices. My guess is that there will be less seats potentially in business class so the prices may rise. Alternatively they fly more often. Either way replacing the seat dense 747 is going to be a challenge, although I suspect these will be the last of the fleet to be replaced and there will be no retrofitting. Looks great, but it all means nothing if the staff and crew are a bunch of grumps. I flew GVA-LCY yesterday, a bag drop dragon wouldn’t let me drop my bag off 1hr 30m before the flight (I was “too early”) and the CSM on my flight was a total pig who never cracked a smile and barely said a word to anyone. But I hope if the crew have more pride in their product, then maybe everything else will improve too. Kudos to BA, hopefully the rollout on this product won’t take too long. So BA put doors on a reverse herringbone seat, Delta put doors on staggered seats…wonder if the next thing will be doors on Apex seats? Lucky – BA suggesting there will be a total of four A350’s by the end of 2019 I believe, plus two 777s. Now, what is BA’s F in comparison?? @ Harry — Good catch, thanks. Not wishing to rain on the BA parade, but in 4/5 years time, when hopefully this might be fleet wide, how much and how far will other Airlines have developed their own Business offering? I almost second @ The nice Paul for the QR comment. Without any behind the scenes knowledge at all I can totally see them either scrap First Class entirely on refurbished planes (alas 777) for increased amount of Club Suites instead and not operate both classes of service on the same aircraft or inevitably make First more exclusive by actually reducing cabin size to install 789 styled seats with further enhancements to the soft product on the way throughout April 2019 as just announced. And so arrives another seat that is difficult for taller people to sleep in. The demand for all-aisle access is drastically reducing sleeping comfort for many of us. The Apex suite is the winning exception. Looks like a huge improvement! This improvement will make the LH product upgrade that they announced seem outdated before they even roll it out. Kudos to BA and we will see how long it actually takes for them to roll it out. But that’s normal: J class is an arms race where each airline continually tries to leapfrog the others. If you standstill – as BA did, for too long – almost everyone else will pass you. They went from the best longhaul J product in the skies, to what was among the least-competitive lay-flat beds. You’re right, of course, that BA offers more First Class routes than most other legacy airlines. But it seems to me a significant number of their routes are dispensing with it – only some of the new 787s have First, for instance. Is BA going to refresh it’s first class? This seat essentially leaving BA in a hot water situation – a better business than first, just like Qatar’s Qsuite in relation to A380 first. It’s no surprising they got this Club Suite seat with closed doors, given Qatar invest hundreds of millions into BA’s parent IAG. Well done BA!!! Combined with their much-improved catering and the excellent bedding that they introduced this past year, this will be one of the best business products around I suspect (it’s no Q-Suite, but it was never going to be given their business model and density requirements from Heathrow). @Lucky, @19nixxon91, I think their new F seat to be announced soon will be an improvement, but it is highly unlikely they will try for a substantially radical hard product… remember their business model, which is to fly vast numbers of both F and J seats on their premium routes from Heathrow, much more so than any other major airline. As it stands F is an improvement, but not a vast one, over J. The differences are substantially in the service and wine quality, and size of the cabin. It’s inconceivable they would scrap their huge F operation, rather I would expect a slightly more impressive (and private) seat with probably an announcement of major renovations/expansions of Concorde room at LHR and JFK, perhaps other improvements to ground services in major premium cities worldwide. Unlike other European carriers, BA only charges a ~30pct premium for First over Club as it stands and expect they will be able to maintain this with differentiated ground services and tweaks to the seat/cabin. I wonder how BA will handle the fact that the A350-1000 is seen as a replacement for the aged 747s but with only 56 J class seats in this new cabin that’s significantly fewer than the 70 or 86 on the 747. For Premium heavy routes like NYC I wonder how that will work. Looks like the seat will be tight in the shoulders area. Other than that it’s an improvement. Now if they’d just get rid of that ridiculous YQ on flights. A disappointment, I’d tale the existing seat any day (and the apex suite above that). I sleep better without my feet in a box. I’m not for innovation for its own sake but I think BA could have tried a bit harder than buy something off the shelf. And why the obsession with doors? Unnecessary weight for no gain. I’m flying Spain to London in August. Any idea when those MAD-LHR flights get announced? I’d love to take advantage. For those of you who are saying this is better than BA First, how exactly is an MRI machine box with a half height door better than a totally open seat? I just don’t understand everyone’s irrational hatred of BA First. Beyond the fact that aircraft with a first-class cabin will have an inferior seat, I think this is much to do about nothing because it will probably be 5 years before even 50-60% of the fleet has the new seat. I can’t imagine they will retrofit the A380. I’ll repeat a question I asked before – can someone point out an airline that has rolled out new products faster and more consistently? Most airlines don’t even install fleet-wide and that’s not due to aircraft retirement. Look at the state of Emirates’ and Etihad’s product on a fleet-wide perspective. At least QR are slowly upgrading an already excellent product. Hot take: BA moving its buisiness product from a D- to an A- helps more people than Qatar moving from A to A+ with the Q suites. If only the fees by BA/the UK for transiting London werent so oppressive. I saw BA ordered 777 x to replace jumbo… Shame as this seems a good product but if the 777X is not as quiet as the A350 it will be a poorer experience. I think this new BA J seat is probably better than AA First. It’s definitely better than AA J on the 777-300ER. Whoever says that AA crew are better than BA wants their head looking at. So lets see what Virgin bring to the table in April. And as for comments that by the time this is completely rolled out it will be outdated. Do you really see AA and CX dumping their J product so quickly? Whilst the finishes look great, I am going to go out on a limb and say that I don’t like it. I love the couples cubby in the middle of CW. Furthermore when I travel with the kids (young) we can stick them in the middle two seats and my wife and I can seat on either side of them and it is very manageable. I quite like looking at my family when I travel, I spend much of my life sitting in euro traveller away from them. The current seat itself is very comfortable even if things like storage and a mini door are missing. Plus once you’re standing up you can see into everyone’s “suites” so they’re not really that private. If this new layout has less density (it may not be drastic because it is not a “true” 4 across layout, just as CW now is not a “true” 8 across layout) then the prices will probably creep up, one of the best advantages of BA CW is the reasonable non-flex prices when booked in advance. I can see BA adopting a twin track setup with their fleet. Notice the way they have tried to market this a little differently by calling it Club Suite. On 3 class planes they will have Club Suite, which bridges the gap left by first class. On 4 class planes they will have Club World, which may be a revamped version of their current product, I’ve seen concepts showing existing style but with a small gap for direct isle access and slight modification of the seat shape but effectively keeping the yin/yang layout. Sorry, but one more thing, how is having 6 aircraft in service within 8 months announcing a brand new product “more of a gimmick than anything”? LH announced a new business class seat over 3 years before it would be flying on any aircraft!!! I appreciate that at the time you called them out on that, but BA having all new-delivery widebodies equipped with the new seat, while retrofitting the first two 772s in the next few months, strikes me as a far more that “gimmicky” roll-out. Let’s try and keep a balanced perspective – it seems to me BA will probably till this out fairly aggressively over the next several years (excepting the 744s of course) but this year they are making inroads already. Thanks for the info, but won’t those routes be served by the A350? I’m curious to see where the first B777s with the new CW suite end up flying from LHR. Unless Toronto and Dubai will be using the 777s, in which case where are the A350s going? For what it’s worth, once these seats become widespread, this will likely mean the end of BA’s cheap tatl business class fares. Ignore me – I misread your question. Me dumb. Looks kind of cramped and claustrophobic. Looks fabulous! I might just start flying BA again once they get their fleet retrofitted, hopefully sooner rather than later. I anxiously await Lucky’s review, again, sooner rather than later! Air India First Class is best I have known. This could be QRs move to strengthen its position in One world. Part 1 of kicking Dougie out of his throne. I like that the bed is a full 2m long, since it means if I bend my knees slightly I’ll be able to fit without issue. The door is wonderful, since privacy trumps just about everything else on a long flight. 90% of the time when I fly BA I choose a window seat upstairs on the 747, specifically because of that extra privacy; the enormous storage bins don’t hurt either. The remaining 10% of the time is when I purchase the flight a week prior to boarding and get stuck with whatever downstairs seat is the least awful. This new business class (when fully rolled out) should mean that no matter where in the aircraft you are sitting, you’ll always have some privacy and storage. I wonder if F will be modified to have doors. My gut tells me yes. Also, from the pics, it seems BA F still offers way more space space since the IFE is, literally, not right in front of your face. paying some premium in miles or dollars, but BA is ridiculous! This might make those outrageous fuel surcharges actually worth it. The pressure is now on for Virgin Atlantic. They have an incredibly tough task ahead in order to trump this and frankly I don’t think they will. My guess is that Virgin will introduce a mildly modified version of the Delta One Suite or a reverse herringbone configuration. I just can’t see them being able to beat this unbelievable seat. I love just about everything with this new seat, the colours, the storage and the functionality. This new club world is up there with QSuites in terms of being the best business class in the world. Couple this spectacular seat with the fantastic new soft product and my loyalty to British Airways for many years looks like it is about to finally pay off. Wow BA is the best. Uninspiring… and lacklustre. The dark upholstery with the confined space just brings to mind cattle pens. BA will just put doors on their first class. and with their new first class soft product it will beat the new club world. Hi Ben – have you (or anyone) written an article that ranks J hard products by space efficiency? Well, it is a super diamond seat with doors. Not more not less. It is not better than BA first class on 787, but it is probably Europe’s best business class seat at the moment. Thumbs up to BA. Catching up slowly, not innovative by any stretch of the imagination, so I’m just a little underwhelmed. Can we expect other ‘innovations’ like dine on demand, or will it just be here it is take it or leave it. The finishes look very elegant. This is a product that could last them many more years to come. Funny thought….what if they installed the current Club World seat as their Premium economy seats, maybe with less recline? That would still be 2-4-2 configuration which is good for WT+. Their First Class product ought be really good to beat this. @Austin – Qatar haven’t invested a penny into IAG. They’ve simply bought a large chunk of the company on the open market, so IAG haven’t seen a penny of what Qatar spent. Generally, the seat looks good but the proof of the pudding will be in the sleeping. The difference between similar seats installed on Cathay, Qatar and Finnair is huge due to the angle at which they are installed and the various differences in finishes. The Finnair version is really cheap and nasty and has a very small cubby for your feet to go, whereas the Cathay and Qatar versions are much much better. I hope that the BA one (which looks well finished) is more at a Cathay/Qatar density than a Finnair one. People are going to be bummed when they are downgraded from Club to First. This is the SAME EXACT SEAT as what can be found on some of AA’s 777-200s and 787-9s. Same seat with a door and nicer finishes. The first A350-1000 to YYZ. LH and PR will be there already with the A350-900s. It looks like a United Polaris seat with a door….which I am not sure adds much and may increase sense of claustrophobia….there better be air nozzles for Ben aka Lucky as there will be no air circulating naturally. For the two 777s, any word or actual layout seatmap details yet that you manage to get wind of? Will the reconfigured seats be getting the same number of rows as the current 777? New Club Suites look very impressive: I like the finish to the cabin, the small details such as the visible stitching lends an elegant , understated look vs. bling in other carrier cabins. I would be surprised if they run a 350 to Dubai as there would be no First cabin, which would be a route downgrade and weak compared to EK. Especially with a Concorde Bar. As for pricing on Club, with corporate policies championing lowest logical fare policies, the pricing on Club cannot be any different to what it is now.